Typing on the PlayStation®4 is made easier with the Type Pad, a full QWERTY keyboard attachment for the DUALSHOCK®4 controller. The Type Pad is a Bluetooth® keyboard attachment that pairs wirelessly with the PS4™. It is compatible with any game or application that supports Bluetooth® keyboards. Type Pad's small and compact design fits sleekly with the PS4™ controller's natural design, allowing for accurate and quick texting with both thumbs during gameplay. A built-in rechargeable battery pack powers the device which can be recharged via any standard Micro-USB cable (not included). 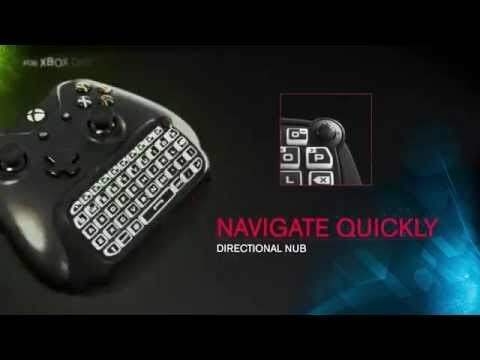 The keyboard also features a special analog nub for quick menu navigation as well as dedicated shortcuts for "@" and ".com". The Type Pad is the ideal way to send game invite messages, enter text into fields while web browsing or chat with fans during your next live stream. Dedicated shortcut buttons for "@" and ".com"
Preserves full functionality of controller and headphone jack. Easy NavigationBuilt-in analog nub for easy menu navigation as well as dedicated shortcuts for "@" and ".com"
1. Can I use the Type Pad with another Bluetooth® device? Yes, you should be able to pair the Type Pad with most Bluetooth® devices. 2. Is the Type Pad available in different colors? Yes, the Type Pad is available in either orange or glow in the dark blue on the PlayStation®4. 3. Can I use a headset while using the Type Pad? Yes, a 3.5mm compatible headset can be plugged into the Type Pad. 4. Can I charge the PlayStation®4 controller through the Type Pad? Yes, the PlayStation®4 controller can be charged through the Type Pad. 5. Can I charge the Type Pad through the PlayStation®4 controller? No, the Type Pad cannot be charged through the PlayStation®4 controller. 6. Can I use the Power Pak and the Type Pad at the same time? Yes, the Power Pak and the Type Pad can be used at the same time.